Iran’s discus thrower Alireza Ghalehnaseri scooped silver in men’s discus throw F56 final in 2016 Rio Paralympic Games. On Saturday, Ghalehnaseri and Ali Mohammadyari of Iran competed in F56 class of discus throw event at the Paralympics, which is underway in Rio de Janeiro. 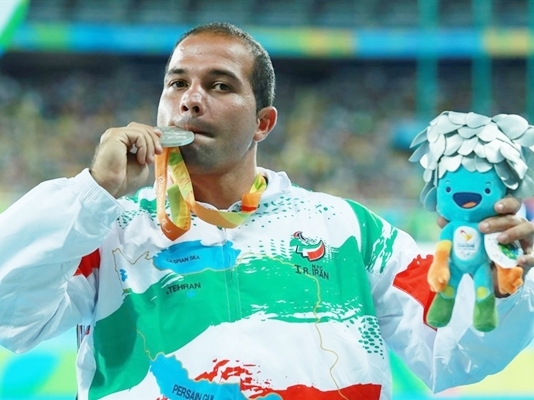 Ghalehnaseri managed distances of 42.32, 42.12 and 43.86 in his first three attempts while he obtained a record of 44.04 meters in his following three throws in order to improve his personal best. The Iranian discus thrower landed behind the host country athlete Claudiney Batista Dos Santos who clinched the gold with his best throw of 45.33. Meanwhile, Leonardo Diaz of Cuba stood on the third podium as he threw the discus as far as 43.58 metres. Iran’s other representative in the same category Mohammadyari was eliminated after squandering the first three attempts, Mehr reported. The Iranian squad in the major sportive event have so far snatched three medals, including a gold by female sports shooter Sareh Javanmardi.